Is it really a dream job, spending the whole day on the beach, working in exotic locations? While all that is true, it is also a job that needs to be taken very seriously. Safety will be your number one concern. You will be in charge of your students and responsible for their health and safety, and spend your day working with many different kinds of people. You need to be able to get along and communicate well with them, even with difficult and demanding customers. You will also have to communicate within your kitesurfing school, and coordinate with the other instructors and the management. If you consider working as a kitesurf instructor as a serious career option, rather than a temporary job during college vacations, the pressure to make ends meet can be as high as in any other job. You might find that you will have less time to actually enjoy kiting yourself than in a normal 9 to 5 job. Also keep in mind that most available jobs are seasonal and only run for a few months. However, being a kitesurf instructor can be a great way to travel the world while earning money. If you choose wisely, you will get a chance to travel to some of the best kitesurfing spots in the world, working with some amazing people. If you are instructing while travelling, you will earn better money than those working in hospitality. You will be on the beach all day and sure, you will be wishing you were kiting all day rather than teaching, but a good boss will probably understand this need, and make sure you get at least some time to go out and surf for fun (check this before you sign up with a kitesurfing school). To find out more about how much money you will be able to earn as an instructor, have a look at the article "How much do kitesurfing instructors earn"? 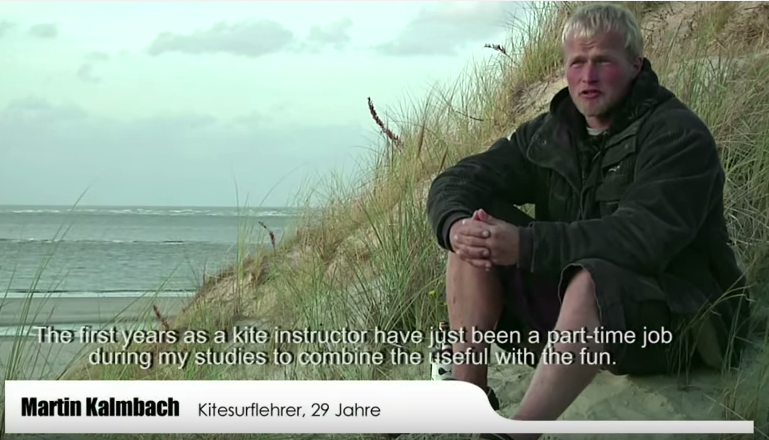 Here are the experience of two full time instructors: Martin Kalmbach is a full time kitesurf instructor splitting his time between Borkum, Germany, and Cumbuco, Brazil. The video below gives an insight into his life and what you are likely to experience if you choose to become a kitesurfing instructor. Kara has been working as a kite instructor since 2009 and is describing her work life and experiences in an article here: My Life as an Instructor.